Home 2017 May 12 What the hell were they thinking? I didn’t think they were even serious about the billboard, at first, until I saw the company who is putting the sign out there. Then that changed my whole thought about the billboard. My position on this billboard is that it should not be put out in public the way they are putting it out there. 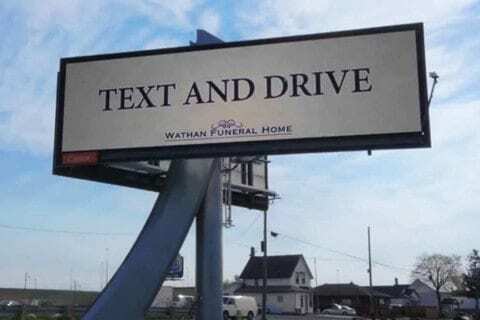 Even though it’s trying to get them business, it still seems like they’re promoting death and people should text and drive. What the hell were they thinking? by Kemonjie is licensed under a Creative Commons Attribution-ShareAlike 4.0 International License. I agree with what your saying because what this billboard represents is morally incorrect. Most businesses don’t care if what they say may cause a loss of human lives if they can make a profit off of it. This business is promoting death just like you say, but in the company’s eyes its just another way to make profit.